After the searing heat in the city yesterday I needed a quick, light refreshing dish. 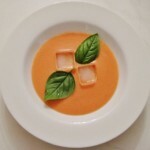 One of my favourites is chilled Tomato soup. The key ingredient is tomatoes full of flavour, it is worth looking around for organic or homegrown ones as these have the best taste. All you have to do is put them through a food processor with some olive oil and a couple of slices of old bread to thicken the mixture. The mixture is strained through a sieve to remove skins and pips. There is no fussing around with peeling or cooking. I add some fresh basil leaves, ice cubes and some grated Grano Padana. I find that the slightly toasty flavour of Grana Padano goes better with the soup than the stronger Parmeggiano. The soup can be made the day before and kept chilled in the fridge. I suggest serving this refreshing dish with a glass of Sancerre, a Sauvignon Blanc from the Loire valley. Wash the tomatoes and basil leaves. Place in food processor and blend well. Strain the liquid into a large bowl through a sieve, using the back of a wooden spoon to press as much juice as possible through the sieve. Add the olive oil and blend again. To serve. pour into individual bowls, add a couple of ice cubes, top with 2 basil leaves and some grated Grana Padano.